I can't resist collecting seeds. Sometimes I venture out, a paper bag or glass jar in hand, and collect them from our yard. More often, I pick them up wherever I happen to be, so it didn't surprise my husband too much when I stopped under a row of shedding Gingko biloba trees on our way into a movie theater. 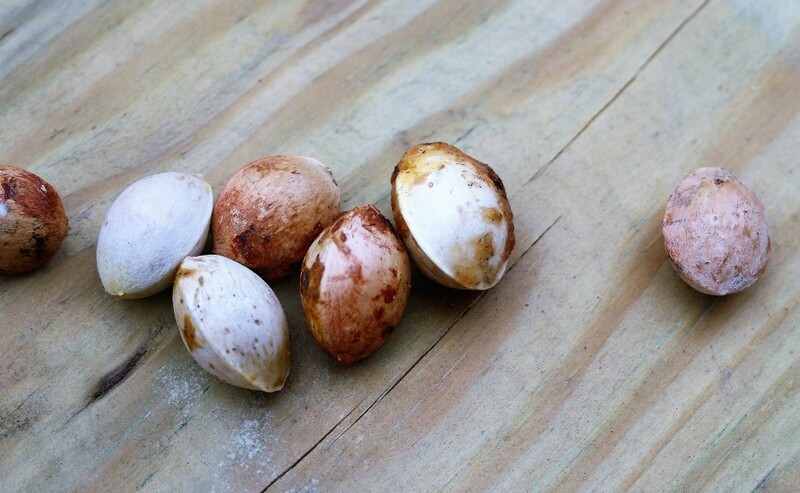 Have you ever collected seeds? "Look, ginkgos!" I cried, grabbing a handful of fat, sticky seeds from the sidewalk. Landscapers generally use male ginkgos because they don't drop ginkgo fruit, which reputedly smells like rancid butter as it rots, but whoever installed the landscaping outside the AMC had planted a few females trees as well. 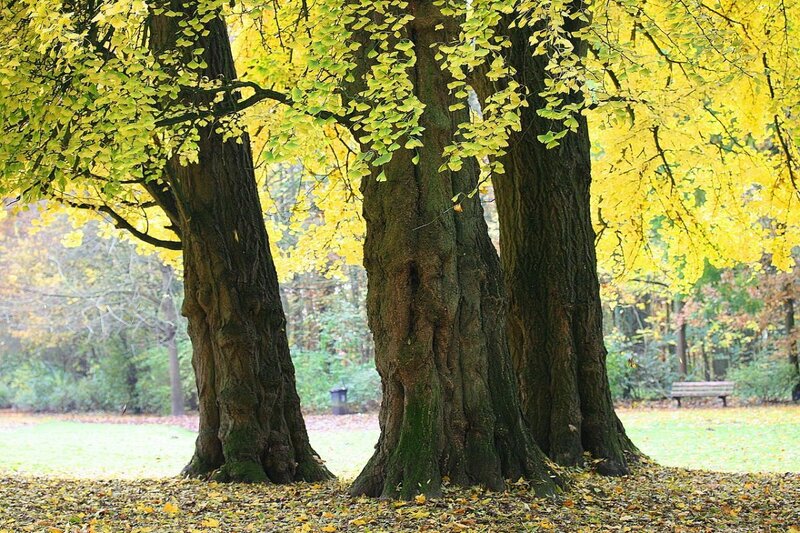 Ginkgos are long-lived trees, the oldest one recorded at 3,500 years old. Most, however, only make it to one thousand. These trees had to be at least 20; female ginkgos don't produce fruit until they're at least that old. The acids in gingko fruit are similar to urushiol, the skin irritant found in poison ivy and poison oak. Although I didn't have a reaction, to be on the safe side, you may want to wear gloves when collecting it. 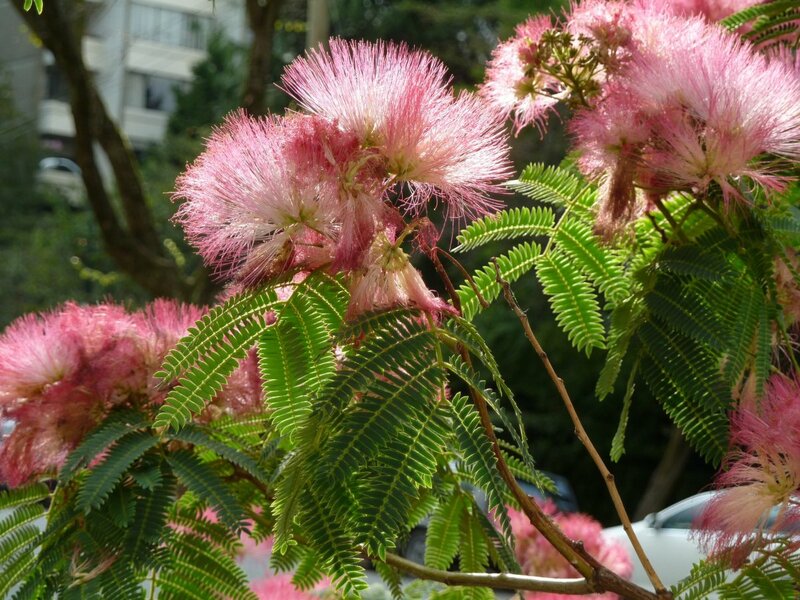 "They're the oldest tree species on earth," I told Dennis, stuffing seeds into my pockets. "They're older than the dinosaurs! Scientists call them living fossils." The look on his face was priceless— a blend of embarrassment, humor and tenderness (or at least I hope that's what it was). He wore the same expression the next day when, while hiking historic St. Mary's City in Southern Maryland, we came across more ginkgo trees, and I grabbed up more seeds— and decided it was fate: I would make starting ginkgo trees from seed my new windowsill project. Ginkgo biloba are commonly called maidenhair trees because their fan-like leaves resemble the leaflets or pinnae of the maidenhair fern. That afternoon when we got home, I sorted the seeds I'd collected and washed them, scrubbing off the sticky fruit as best I could. 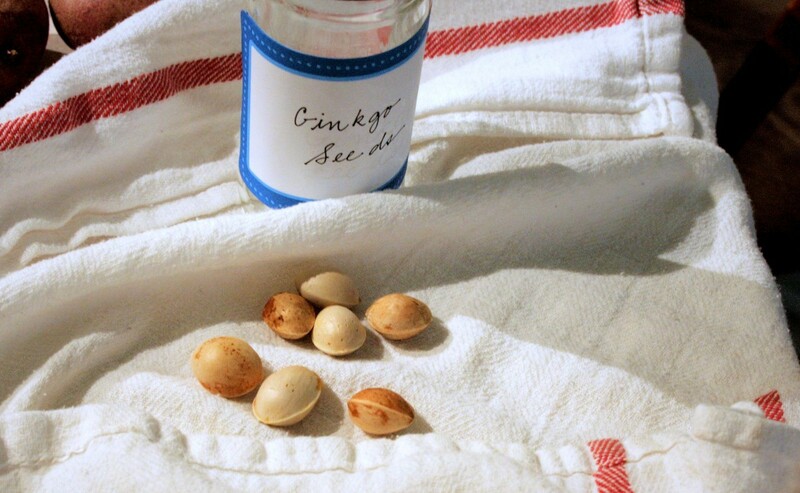 Then I set them on a clean, dry cloth to dry and began researching how to start ginkgos from seed. All the sources that I read agreed on one essential step in the germination process: stratification. Stratification refers to artificially reproducing the moist, cool conditions some seeds need in order to germinate. 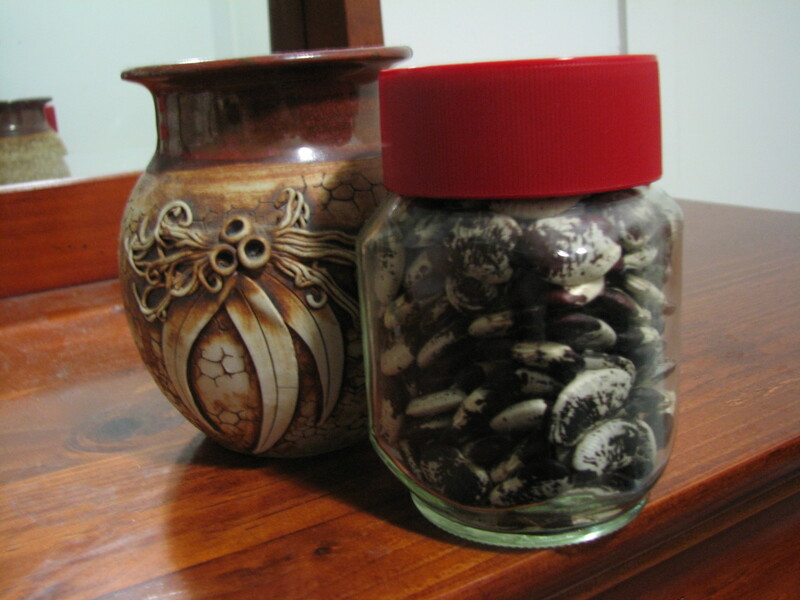 A few of the seeds I simply cleaned and tossed into an old glass spice jar, then stored in the refrigerator. For others, I opted to follow the basic procedure for stratification outlined in my Maryland Master Gardener Handbook, which entails placing the seeds in moist growing medium and refrigerating them 10 to 12 weeks (506). You know, a project. 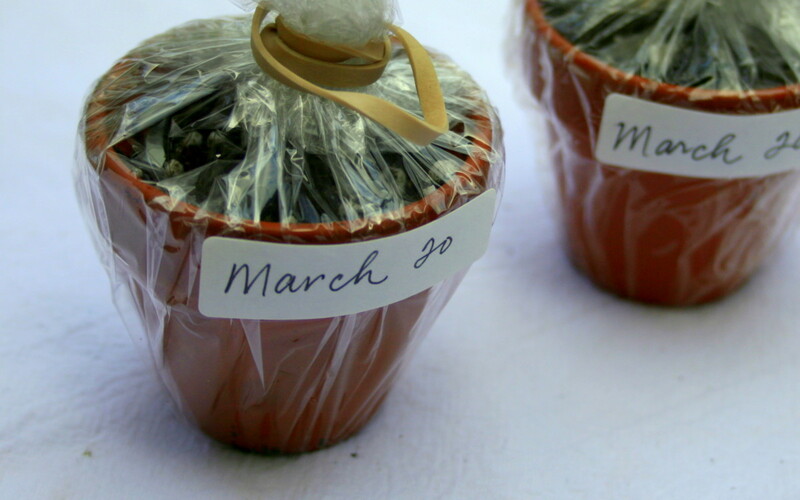 Before beginning, I made sure my pots and seeds were as clean as possible to prevent mold during germination. After reading a study about sterilizing seed for commercial nurseries, I also soaked the ginkgo seeds in 3% hydrogen peroxide for four hours. Then, before planting, I rinsed them with water. Because ginkgo seed coats are hard, I opted to scarify some of the seeds, too, just to see how it would impact their germination. 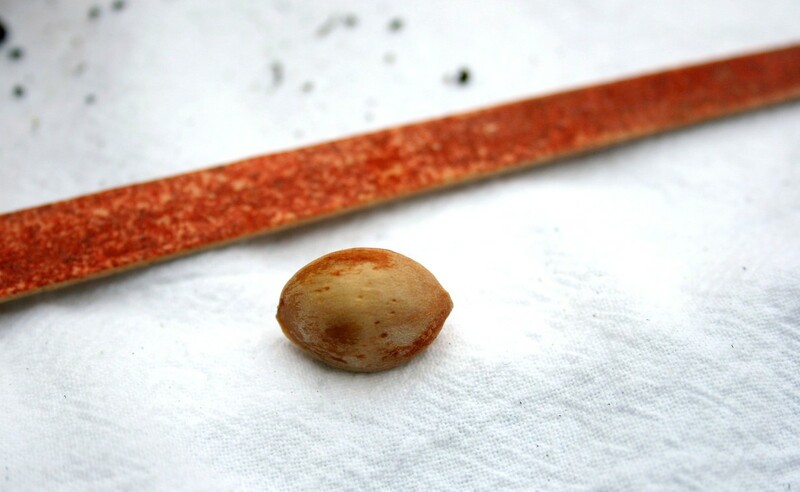 Using an emery board, I scratched the seed cases to allow moisture to more easily penetrate them. 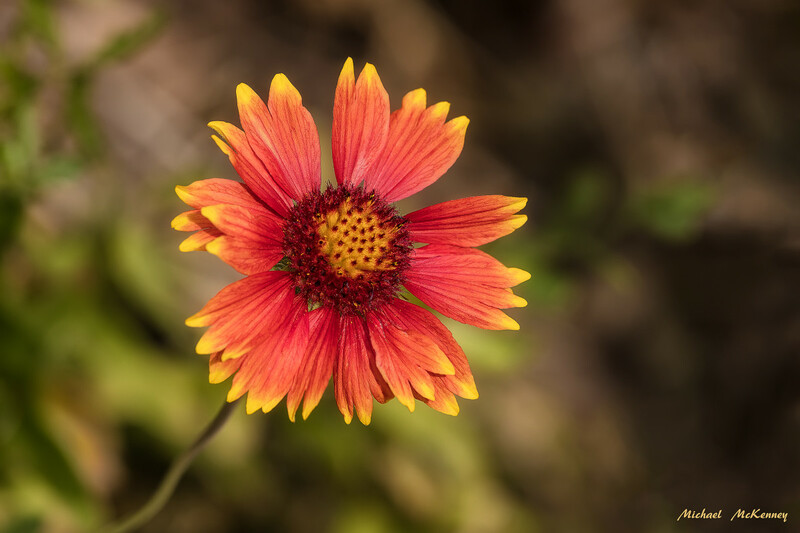 Other methods for scarifying include rubbing seeds with sandpaper, nicking them with a knife, and soaking them in hot water or a concentration of sulfuric acid. Next, I prepared the growing medium. 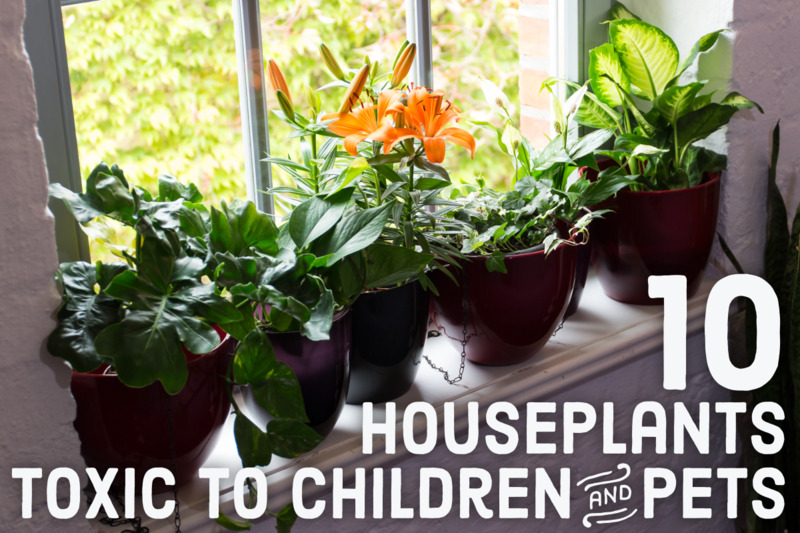 The Master Gardener Handbook recommends peat moss, vermiculite or sand. 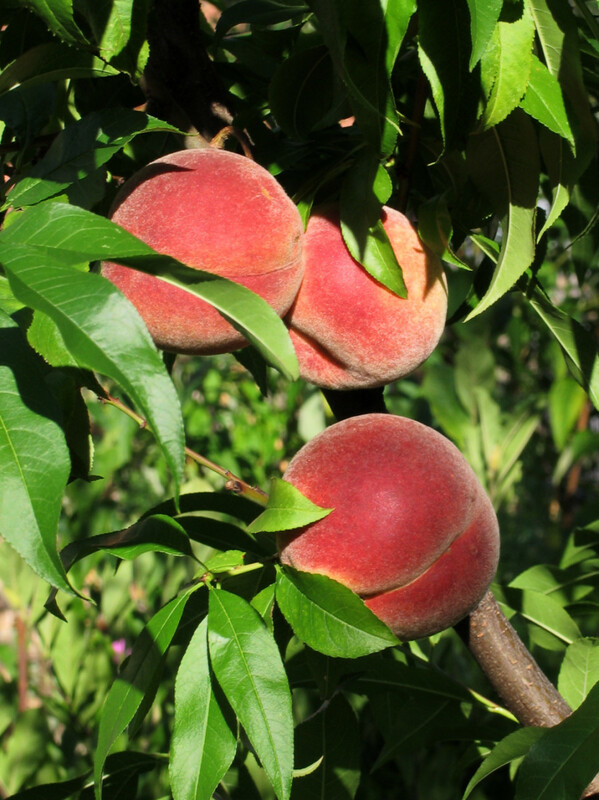 The idea is that the medium should retain moisture without holding so much water that it causes rot. I didn't have any of recommended mediums on hand per se, but I did have potting soil for cacti in the garage, a blend of peat, sand and perlite, so I used that, first filling the pots with the mixture, then adding the seeds and covering them with about a half-inch of the medium. Then I watered the pots multiple times, allowing them to drain after each watering. 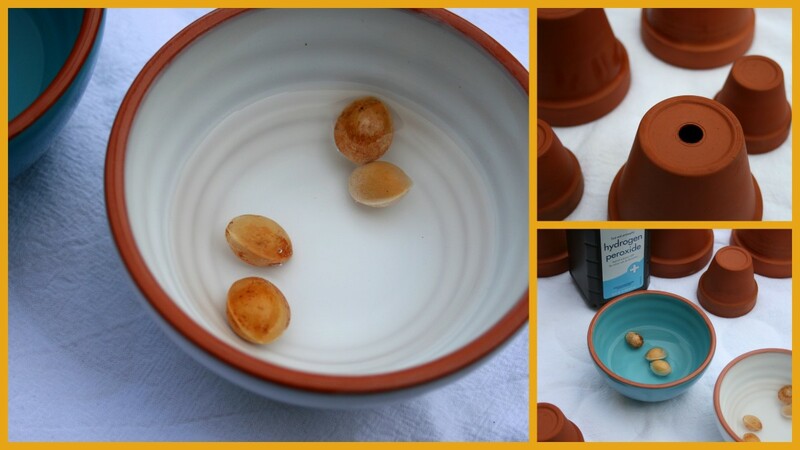 Because the potting medium was fine and flyaway, I found it easiest to pour the water into the pots with a cup. Finally, I placed the pots in plastic bags, secured the bags with rubber bands and set them in the refrigerator. There they will stay for about ten weeks, at which time I'll move them to the windowsill and wait impatiently for signs of life. I'll keep you apprised of their progress. I'm interested to see which seeds germinate the quickest. With any luck, I should have photos of some lovely green sprouts to share this spring. While researching Ginkgo biloba, I ran across an interesting article on the Kew Royal Botanic Garden website. 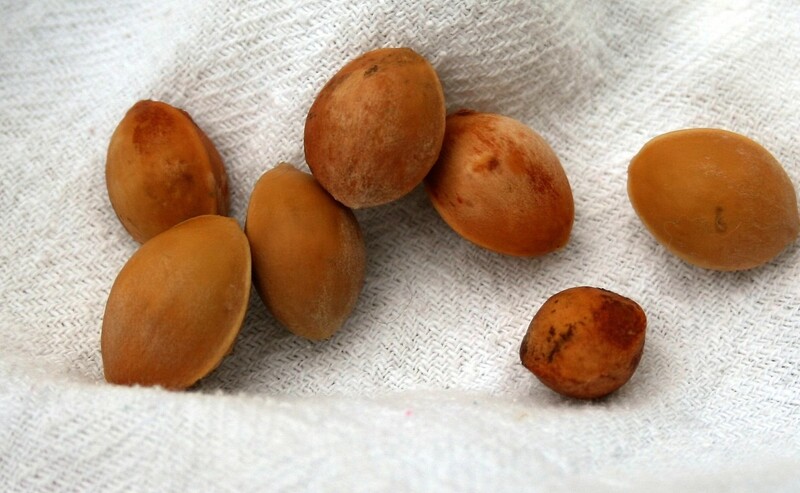 According to the article, Kew starts its own ginkgo seed each year, first removing the flesh from collected fruit, then stratifying the seed by placing it in cold storage. In the spring, the seed is sown in well-draining compost in one of Kew's greenhouses, and germinates in eight to ten weeks. The following spring, when they're good-sized seedlings, the trees are planted in Kew's Arboretum Nursery field. At about two years old, the ginkgos are ready for planting in the gardens proper. 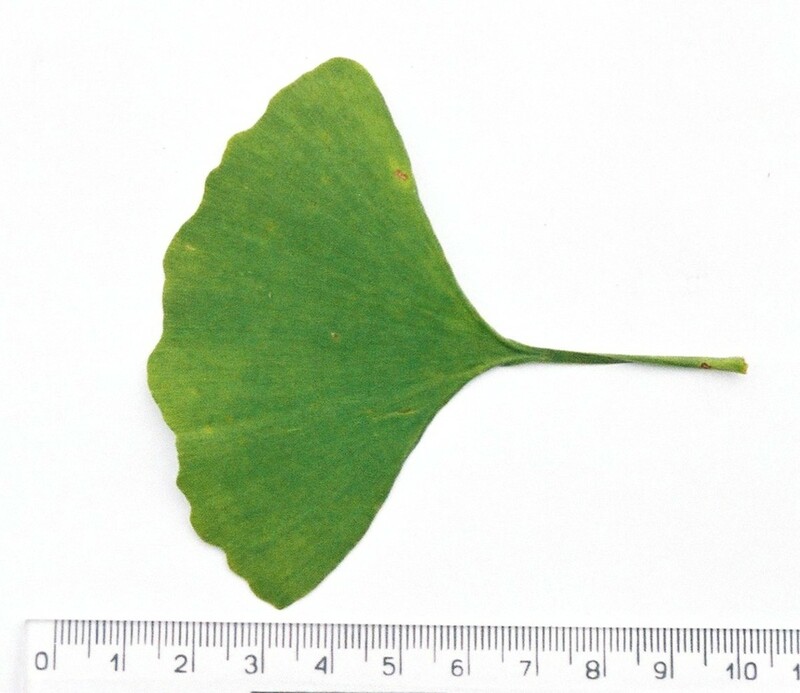 Which of your methods yielded the best results of starting a Ginkgo tree? Scarification, sterilization, etc. Which methods do you recommend? I read your article about growing Gingko Biloba from seeds and recently tried it myself. 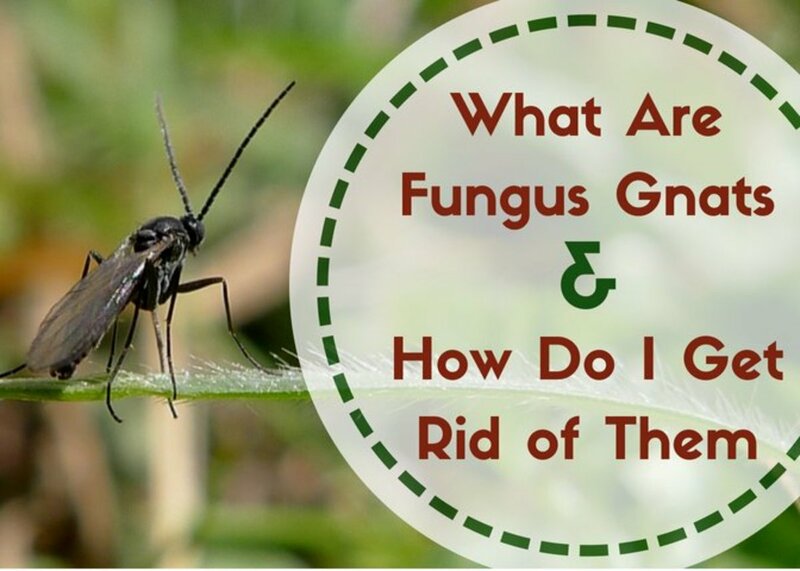 One of the many articles I read said to germinate them in March, which I did. Three have since terminated one of them in six days! My problem is I live in Australia, and it's Autumn. Soon, it will be winter, and I am concerned for my seedlings. Should I bring them in and out them under a growth lamp, as well as keep them warm? Since I don’t know how hard your winter will be, it’s difficult to answer; however, if it’s mild, you could place the seedlings in a protected area outside and cover them with a homemade cloche. 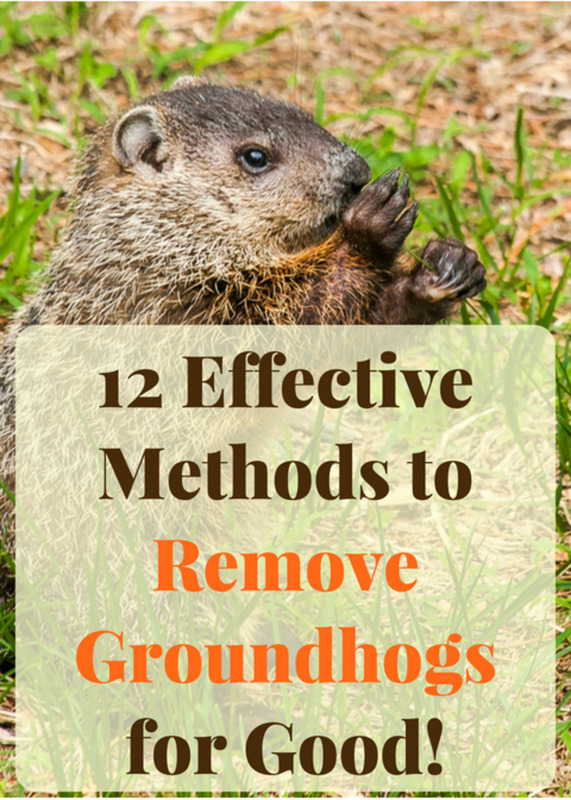 You could also try several overwintering sites and experiment. I put mine between a shrub and our house with a soda bottle over it. How wonderful, A! Keep us apprised. I'd love to pics of your little tree as it grows. 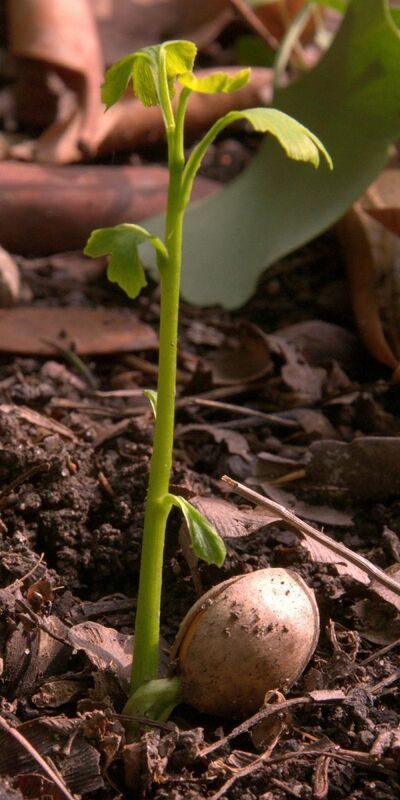 I ordered a bag og ginkgo nuts from Chiltern seeds, and planted teo of them straight away. No cold stratification, but scarification with sand paper, until a very small hole formed at the pointy end. Now, a few weeks later, one of them has germinated. OMG, Susanne. That's wild. Hello, neighbor! Wow. Just looked for info on ginkgo tree seeds while parked in front of St. Mary's College's row of Ginkgos! Yep, I'm here looking at a female ginkgo and wondering how to grow a tree from the seeds. Thanks. Dear in hộp giấy, I appreciate your comment. Cheers! Best to you with the Ginko. I can feel your excitement. At the same time, you teach us so much by sharing the process. Thank you. I don't think I have seen one of these so I'll look out for them. I now know how to start trees from seeds. We seem to take it for granted here in Asia where we are right now as seeds seem to grow easily. This is just from my observation but your article made get interested. Thanks, Lee. I already have a gooseneck lamp out in the camper I could try that with. Good deal! Hope you're keeping well in sunny Florida. It's about to snow here, and I can't wait. I hope this project works. 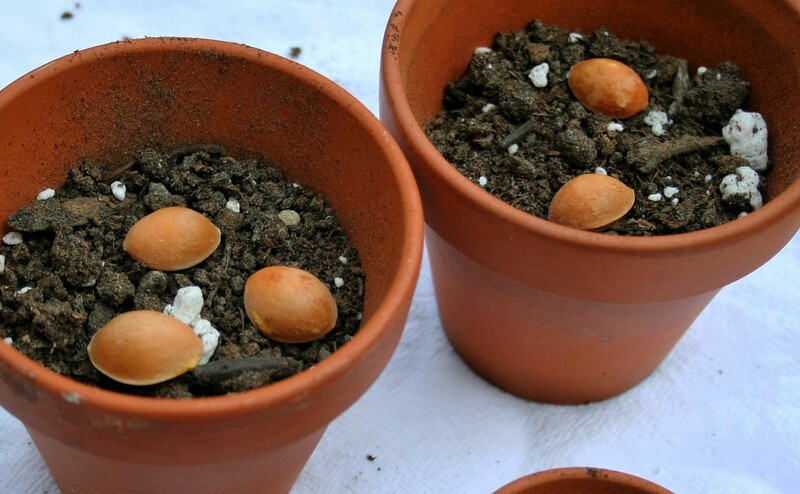 I have a feeling the seeds will germinate, but getting them enough warmth and light prior to hardening the seedlings off outside will be a problem with just a windowsill. I hadn't read anything about the short shelf life of ginkgo seeds, but it makes sense given their size. Always good to hear from you, Lee. I may have to try this again, prior tries all failed but I didn't stratify. I vaguely recall reading that Ginko seeds have a short shelf life too? 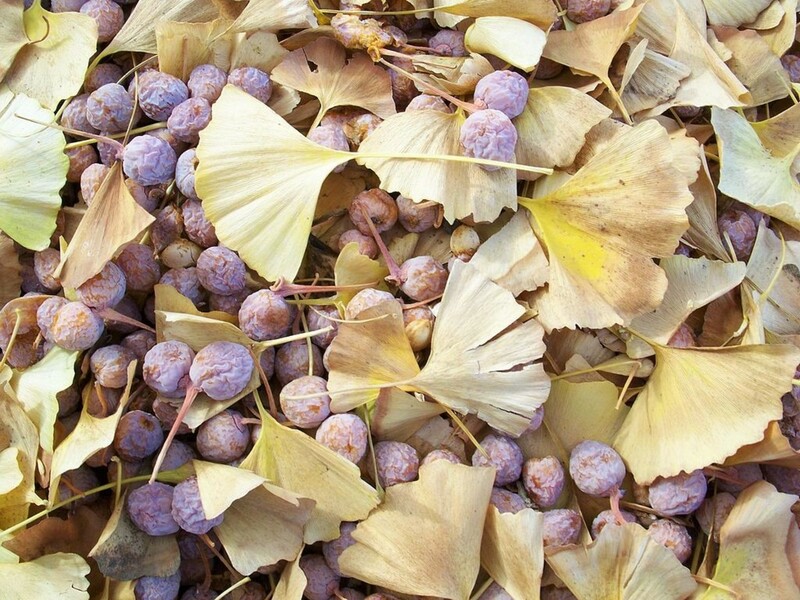 Yes, I've read that but never taken ginkgo biloba as a supplement or eaten the leaves. What's their flavor like? Have you ever had the seeds? I understand they're very good but must be cooked carefully because they can be poisonous otherwise. We have them in our orchard garden. 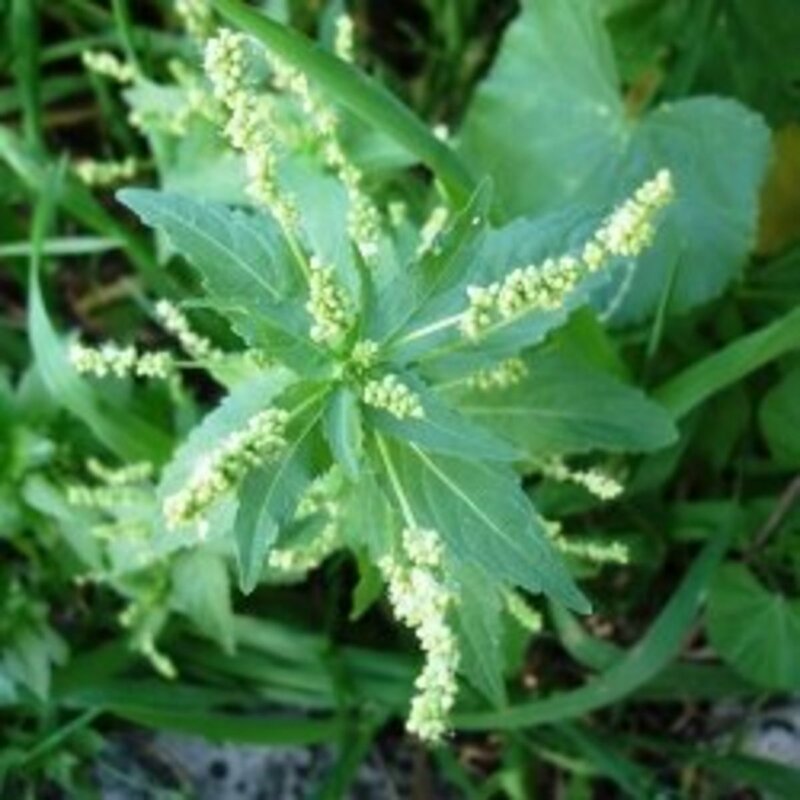 Leaves are good in salad and benefit memory. I've heard of them, for sure, but I wouldn't recognize one if I tripped over its roots. Thanks for the primer on them. The trick is to find one here in Washington.